Las Vegas, NV – High school student leaders across the Las Vegas Valley are ready for action. They have been registering their peers to vote and asking about the issues that matter most to them. “Inspire Nevada wants to offer a space for the youth to speak directly with their elected officials and normalize this type of relationship to increase civic engagement in Nevada,” said Ashley Stevens, program coordinator for Inspire Nevada. Among those confirmed for the event are: Andy A. Hafen, Mayor, City of Henderson; Yvanna Cancela, Nevada State Senator; Pat Skorkowsky, Superintendent, Clark County School District; Felicia Ortiz, Nevada Board of Education; Lawrence Weekly, Clark County Commissioner; Isaac Barron, Councilman, North Las Vegas; and Gail Anderson, Deputy Secretary of State – Southern Nevada. “I cannot wait to meet with our elected officials. This will allow us to see what’s in store with our local and national governments so that we can further our knowledge and advocate the youth vote,” says Inspired Leader, Kevin Camelo, a senior from Southwest Career and Technical Academy. He hopes to speak with the elected officials about equity in education in Nevada. 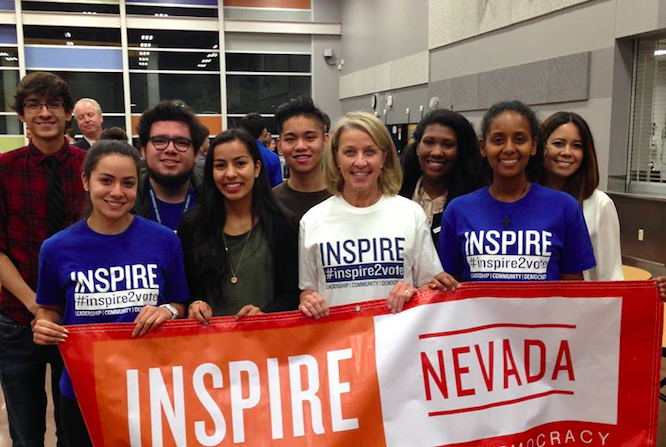 Inspire Nevada is a non-partisan, non-profit program that empowers high school students to amplify the voice of their generation by registering and engaging first-time voters while driving civic action in their communities.